Are you launching a crowdfunding campaign? Want to use social media to promote it? To reach your goals, you’ll need to use social media before, during and after your campaign. In this article you’ll discover how to use social media to achieve crowdfunding success. • On which channel do you have the most followers? • Where do your prospects converse and share? • What people have the greatest influence in your community? • Which platform are you most comfortable with? 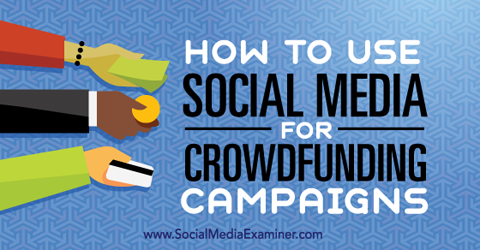 Discover how to use social media for crowdfunding campaigns. For most crowdfunding campaigns, the right channels will typically be Facebook and Twitter, because they reach the most people and encourage the most interactivity. But also take into account where you’re most active socially and on which platforms your community is talking. Instagram is becoming increasingly popular, and LinkedIn may be more appropriate if your campaign caters to a professional audience. Create a unique hashtag for your crowdfunding campaign and use it in all of your social media posts. This allows you to organize the posts into one topic page. With all of the conversations in one place, people can easily find them and learn more about your crowdfunding campaign. Choose a campaign hashtag to use in all of your social media posts. Encourage your supporters and donors to use the hashtag as well. This helps you keep track of what people are saying about your campaign and draw in new people unfamiliar with it. 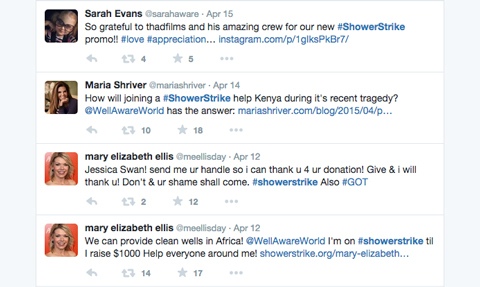 Shower Strike, a crowdfunding campaign for clean water, includes the hashtag #showerstrike in their social media posts. 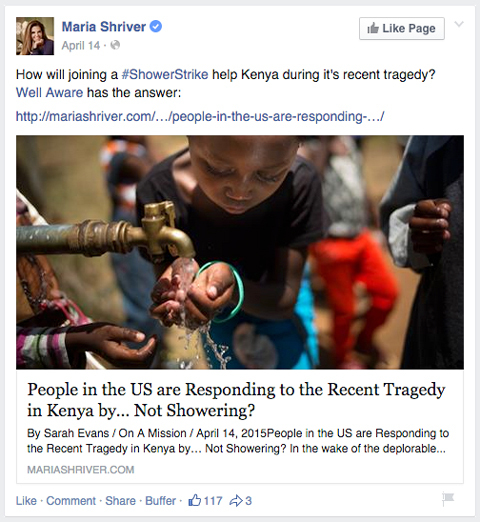 In addition, Shower Strike supporters and followers use the hashtag in their posts, which helps drive easier discovery on social media and more brand awareness. Use of your hashtag by followers and supporters drives awareness of your crowdfunding campaign. Choose hashtags that are unique, short and catchy. If you get enough mentions of the hashtag, you might even start trending. Your community is the most powerful asset for meeting your crowdfunding goals. Your followers help you reach new audiences, drive donations and create social proof. Rather than rely on only your existing Facebook network, amplify your reach by creating a Facebook page for the campaign. A campaign-specific Facebook page is a central place to host the true believers in your community and post updates without diluting your existing brand or outreach. 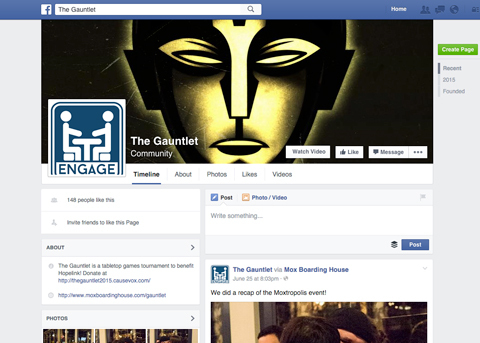 The Gauntlet, a crowdfunding campaign by Mox Boarding House, created a Facebook page to engage a core group of advocates within their community. 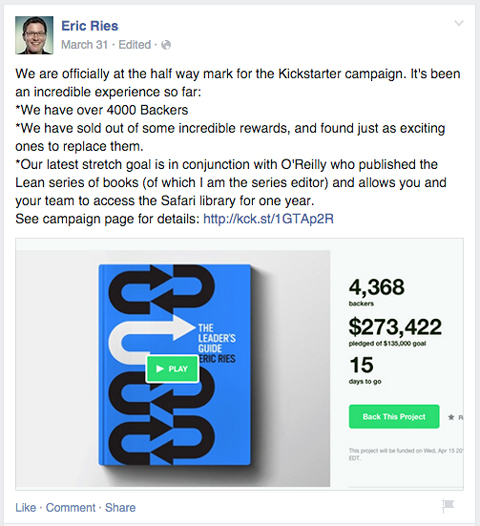 Create a Facebook page for your crowdfunding campaign. Your Facebook page can be a place to deliver campaign news to advocates and backers so they can share it, comment on it and take action. You can also share content on this page (or from this page) with your existing brand page. If you’re running a crowdfunding campaign for a personal project or you want to keep your community more private, you can use a Facebook group or event instead. A Facebook page is typically better suited for larger communities. Every Facebook page comes with page Insights. These analytics enable you to see the performance of your page based on likes, reach, engagement (comments, shares, etc.) and demographics. 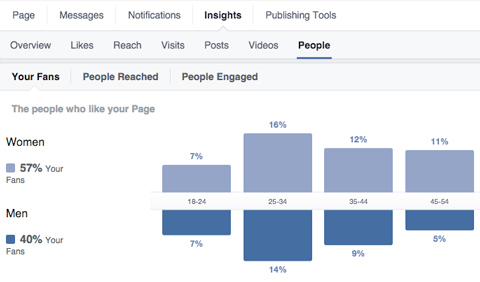 Use Facebook Insights to find out what’s working (or not working) on your campaign page. Use this data to determine what’s working on your page and what you need to adjust. In addition, look at the composition of your campaign followers so that you can craft content that appeals to your demographic. It’s important to use a push-pull technique when creating your Facebook posts. Take the time to write engaging posts that entice your community to respond. In addition, keep pushing updates to your community. Your fans will appreciate your keeping them informed when the campaign hits important milestones, especially if they’ve contributed. For example, let your community know when the campaign has reached a major funding milestone or has been featured in a prominent news outlet. Share campaign milestones on your Facebook page. Remember to thank your community for their contributions. 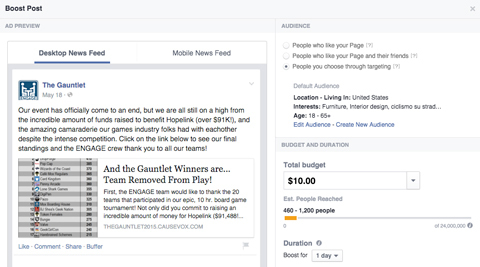 If you have the marketing budget, you can also increase your Facebook reach by boosting your posts. 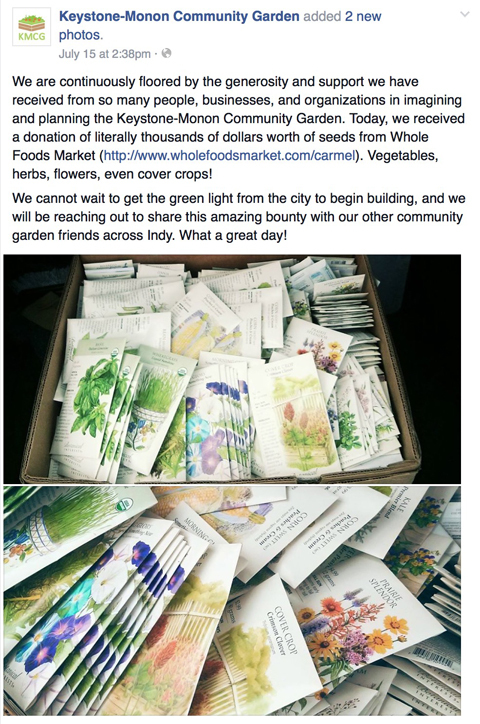 This is a great way to reach friends of friends or people with interests related to your crowdfunding campaign. Boost the posts on your Facebook page to increase your reach. When you boost posts, you can choose your audience (people who like your page, for example), budget (your advertising budget) and duration (the number of day to boost the post). The goal of using social media for crowdfunding campaigns is to increase awareness and drive contributions to your campaign. To drive social sharing, use a mix of informative and sales-type posts. About 80% of your campaign-related social posts should educate and inform without focusing on sales. These posts help drive engagement and shares, and condition people to come back to your page for more. If you’re a product-focused crowdfunding campaign, post an interesting photo of the product being revealed. KNO Clothing, a startup that produces American-made t-shirts and contributes funds and clothing to the homeless, launched a crowdfunding campaign to launch a new line. Here’s an update they used to showcase their campaign’s product. For a product-focused campaign, give your audience a preview by posting a photo of the product. Project AWARE is a nonprofit focused on saving and protecting the oceans. On their Facebook page, their posts feature emotive images that tie directly to their mission. In addition, the posts are newsworthy, timely and highly targeted to their audience’s interests. 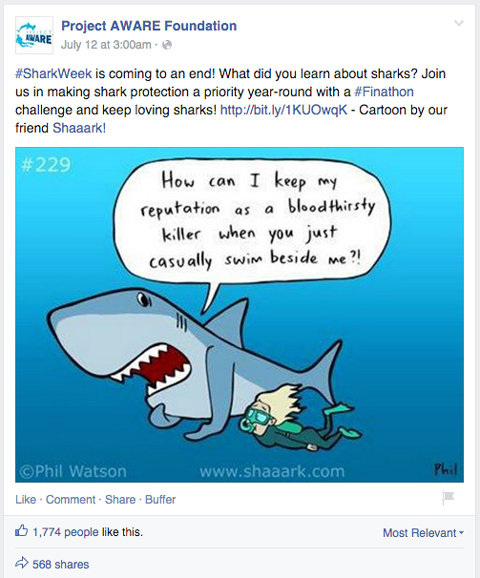 This post for Project AWARE’s crowdfunding campaign #finathon uses humor and invites conversation to drive social sharing. Create sharable content to extend your reach. 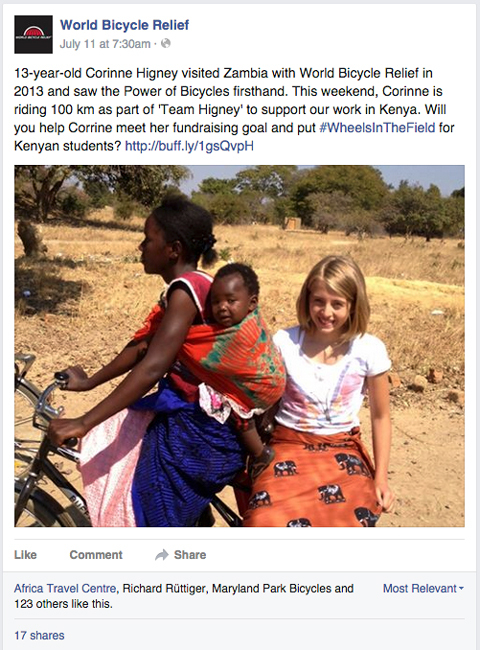 Also share stories from your supporters, like this 13-year-old who helped raise money for World Bicycle Relief’s crowdfunding campaign. Share stories from your supporters. Post campaign updates, behind-the-scenes looks and impact/success stories as well. Heartwarming and inspiring posts are a great way to remind your audience why they’re involved with the campaign. About 20% of your posts should focus on driving the user to contribute or share the crowdfunding campaign. 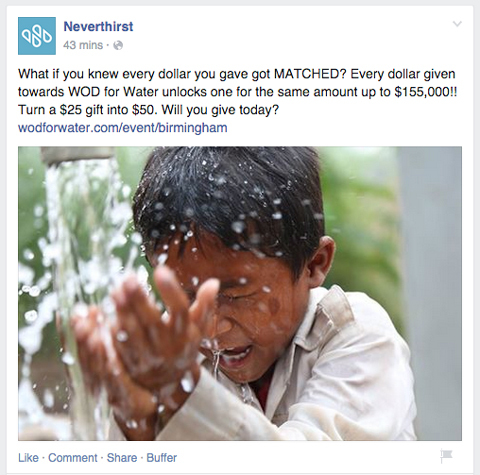 This post from WOD for Water, a crossfit-focused crowdfunding campaign, explains how a small $25 donation can turn into a $50 donation. The call to action helps to create a sense of urgency and drives the viewer to donate today. Include a call to action so people can contribute to the campaign. If you focus on cultivating your community, sales-related posts will likely generate strong results. 1. Start by creating one week of content that can be used across all of your social channels. 2. Review and monitor the performance of each social media post. 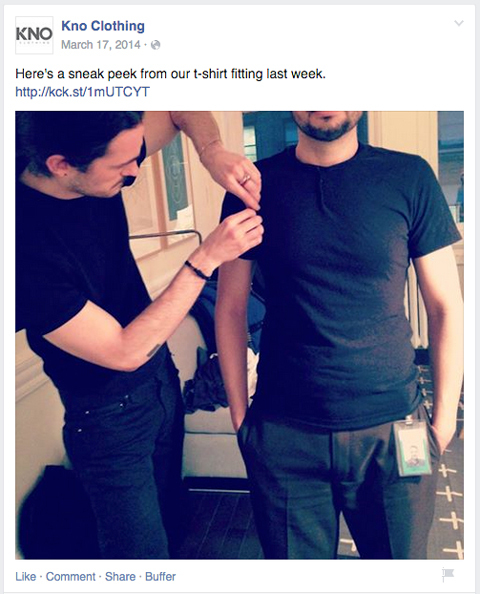 On Facebook, look for shares and comments to measure engagement. On Twitter, look for mentions and retweets. 3. Based on which posts perform the best, tweak your content to get the most impact. It’s important to reach out to journalists to publicize your crowdfunding campaign. Twitter is widely used by journalists to not only share information, but also communicate with other users and find leads for stories. You’d be surprised how many published stories originate from companies pitching an idea. Before making contact with journalists, familiarize yourself with their work and the outlets they write for. Make sure your story would be a good fit with what they’ve previously written. Then follow them on Twitter and try to build a relationship. Keep in mind that most journalists have a preferred method of communication to receive pitches. Be aware of journalists’ communication preferences when it comes to pitching. You may be able to determine this by reading their social comments and tweets or by looking at what’s listed in their profile. When in doubt, use email to pitch your story. In your pitches, keep your message short and link to your campaign or a recent story with the hashtag so journalists can find out more information about the campaign. If they don’t accept DMs without following you back, tweet them and ask for their contact information. Social media is crucial to the success of crowdfunding campaigns for individuals, brands and nonprofits. Focus on creating shareable content and cultivating a community on social media so you can reach new audiences. The more effectively you use social media, the more contributions, pledges and donations you’ll receive. What do you think? Have you launched a crowdfunding campaign? What strategies have worked best for you? Please share your thoughts in the comments below. 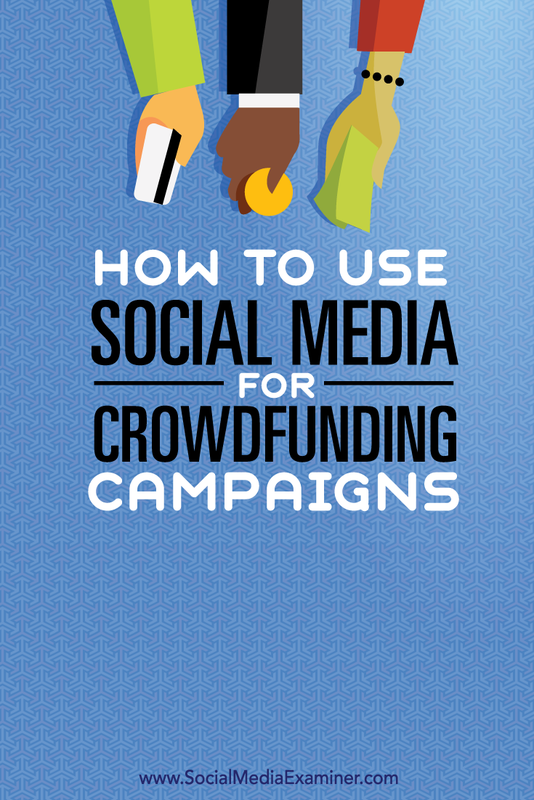 Tips for using social media for crowdfunding campaigns. Rob Wu is the CEO of CauseVox, a crowdfunding platform for nonprofits and social good projects. Rob has raised over $200,000 for his own social good crowdfunding projects, and writes about crowdfunding best practices on the CauseVox Blog.